When I first read about this, I figured it was some image maker. My second thought was… boy, they’re in for a treat since DLS forgot to mention the more advanced scraping now that implements some OCR technologies. Needless to say, this method does make it simple to create images of your email to put on a website and it does deter most text scraping from pulling emails. Unfortunately though, in the same fashion that spammers are overcoming captchas, scrapers are now turning to OCR to actually deal with images. 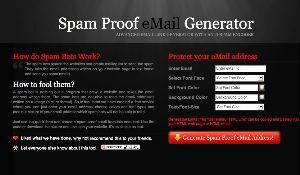 And in that sense, Spam Proof Email Generator, doesn’t quite live up to the “proof” part of the name. Regardless, a little protection is way better than none when you’re riding through spam’s neighborhood.